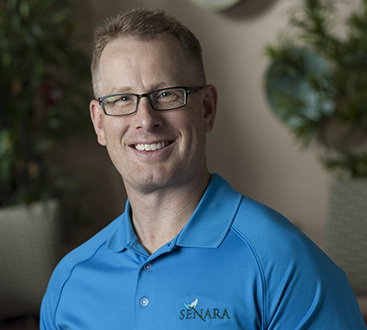 In addition to Senara’s medical spa treatments, we offer a full range of day spa services made with men in mind. Whether you need a massage to work out tight muscles, or are looking for a polished, board-room ready appearance with our men’s facial and nail services, we’ve got you covered. Senara’s five star accommodated day spa is an escape from the stressors of the day to day. Our 7,000 square foot space features 8 treatment rooms, a tranquil manicure and pedicure area, separate men’s and ladies locker rooms and lounge areas, and shoppe. The men’s lounge even features a large, flat screen TV and comfy chairs with foot stools for you to sit back and relax between services. All of our spa providers are licensed in the state of Illinois and are experts in their fields. Soothe tired muscles and alleviate stress. Restore flexibility and relieve pain. Cleanse and invigorate skin for a polished look. Clear skin and unclog pores. Smooth and soften rough hands. Rejuvenate your feet with our specially designed pedicure for men.